A new podcast from Opera News promises to take listeners To Hell and Back. This week, San Francisco-based period-instrument orchestra Philharmonia Baroque presents the world premiere of a new mini-opera by composer Jake Heggie and librettist Gene Scheer. Written specifically for PBO and its Baroque instruments, To Hell and Back is a modern-day telling of the tale of the goddess Persephone, evoking destiny, love and survival. 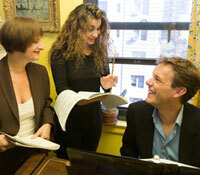 The first episode of Opera News (MP3) offers a preview of the new work. I gave it a listen and I think I got stuck in Hell!